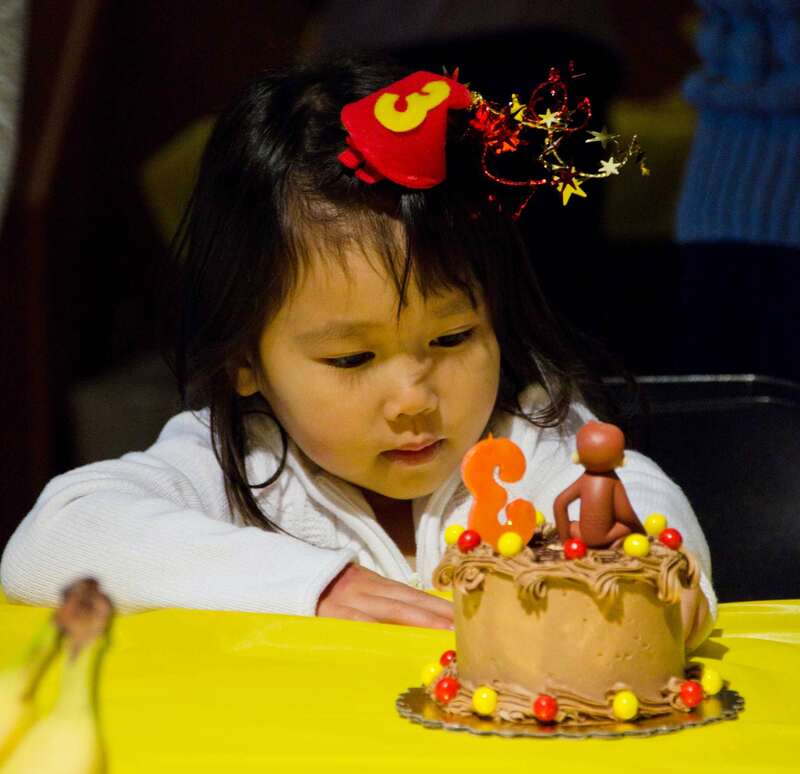 Have your next birthday party at CuriOdyssey! All parties include free admission to CuriOdyssey for the entire day. Please note that CuriOdyssey membership does NOT include free admission to private parties, including birthdays held at CuriOdyssey. Members will be included in the total guest count. You are encouraged to bring in food or activities to fit your chosen party theme. Please, no alcohol, noisemakers, animals, piñatas or balloons. These items will be confiscated by CuriOdyssey staff. Choose from one of our birthday packages to create the perfect party for your child. Rental of a private party space in our Classroom with adjacent outdoor patio. Two hours of party time, plus 30 minutes prior and 15 minutes after for setup and breakdown. Four tables and 24 chairs for dining, counter space for food and drink setup, and bins for trash and recycling. Room capacity is 24 people total, including the host family, birthday child and adults and kids of all ages. There is no room for additional attendees, as per the order of the San Mateo County Fire Marshall. There are no exceptions. Trash and recycling bins and bags. Please make sure that all refuse is put in the proper bin at the end of your party. Four tables and 24 chairs for dining, and space for food and drink setup. Saturdays and Sundays from 11 a.m.-1 p.m. or 2 p.m.-4 p.m., plus additional setup and breakdown time. To learn if your date is available, please email birthdays(at)curiodyssey.org or call 650-340-7565. Rental of a private party space in our Theatre and Classroom with adjacent outdoor patio. Room capacity is 49 people total, including the host family, birthday child and adults and kids of all ages. There is no room for additional attendees, as per the order of the San Mateo County Fire Marshall. There are no exceptions. Rental of a private party space in our Redwood Hall with adjacent indoor Bayview Terrace. Two hours minimum of party time, plus 30 minutes prior and 15 minutes after for setup and breakdown. All party counts include the host family, birthday child, and adults and kids of all ages. Additional party guests in excess of paid included count receive admission at $9.75 per person (to be paid by party host). Please note that CuriOdyssey membership does not include free admission to private parties. Redwood Hall Revelry pricing is hourly, and depends on how many people are expected at your party. Remember to include time for setup and breakdown! At least 30 minutes for setup and 15 minutes for breakdown are recommended. Saturdays and Sundays from 10:30 a.m.-4:30 p.m., plus additional setup and breakdown time. Invite your child's favorite animal to the party! 30 minute private engagement led by a CuriOdyssey wildlife keeper. Inquire directly for available animals! Availability is based on the health, temper, and well being of our animals, and when staff is available. This program may not be available on all weekends. To learn if your date is available to include this program, please email birthdays(at)curiodyssey.org or call 650-340-7565.
in their honor. They can choose their favorite! CuriOdyssey does not allow balloons, noisemakers, or piñatas. Please make sure that goody bags do not contain these items. If you plan for an entertainer, please inform them of this policy. These items will be confiscated by CuriOdyssey staff. All Classroom Celebration parties have a strict capacity limit of 24 people. All Stair Step Shindig parties have a strict capacity limit of 49 people. These counts include the host family, guest of honor and children of all ages. Please plan your guest list accordingly, as CuriOdyssey staff will not allow more than your room’s count to enter your party. This is per order of the San Mateo County Fire Marshall, and there are no exceptions or negotiations. To ensure space availability, we recommend that reservations be made at least four weeks in advance. Animal Ambassadors may book up quickly, so more advance notice is recommended. Please email birthdays(at)curiodyssey.org for availability before sending the reservation form. Birthday parties can only be reserved up to three months in advance. CuriOdyssey will not book or hold dates more than three months in advance. Birthday parties must be paid in full at the time of reservation. Please inquire for the cancellation policy. Please email birthdays(at)curiodyssey.org to check availability or to set up an appointment to view the birthday rooms. Unscheduled walk-ins may not be accommodated. Once the reservation form is received and payment processed, a confirmation will be sent to you by email. For more information, please email birthdays(at)curiodyssey.org or call 650-340-7565. Are you a member of CuriOdyssey? CuriOdyssey members receive a 10% discount on all birthday packages! Make sure to note on your reservation form that you are a current member, or join today! Not a member yet? Visit our membership page to learn more or become a member today. You can start using your benefits, including birthday party discounts, immediately.